Aim and Scope: The New Yearbook for Phenomenology and Phenomenological Philosophy provides an annual international forum for phenomenological research in the spirit of Husserl's groundbreaking work and the extension of this work by such figures as Scheler, Heidegger, Sartre, Levinas, Merleau-Ponty and Gadamer. Contributors: Esteban Marín Ávila, Thiemo Breyer, Jakub Čapek, Mariano Crespo, Roberta De Monticelli, John J. Drummond, Søren Engelsen, Maria Gyemant, Mirja Hartimo, Elisa Magrì, Ronny Miron, Anthony J. Steinbock, Panos Theodorou, Íngrid Vendrell Ferran, Antonio Zirión Quijano, and Nate Zuckerman. Submissions: Manuscripts, prepared for blind review, should be submitted to the Editors (burt-crowell.hopkins@univ-lille3.fr and drummond@fordham.edu) electronically via e-mail attachments. 11. On Axiological and Practical Objectivity: Do Husserl's considerations about objectivity in the axiological and practical realms demand a phenomenological account of dialogue? Rodney K.B. Parker is a Postdoctoral Researcher at the Center for the History of Women Philosophers and Scientists, Paderborn University, Germany. Ignacio Quepons is Associate Researcher at the Philosophy Institute, Veracruz University, Mexico. 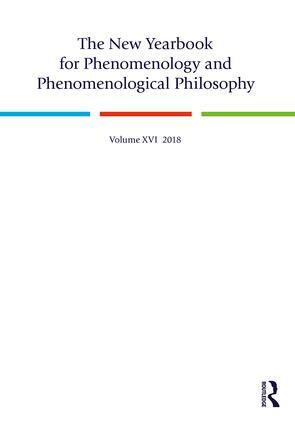 The New Yearbook for Phenomenology and Phenomenological Philosophy provides an annual international forum for phenomenological research in the spirit of Husserl's groundbreaking work and the extension of this work by such figures as Scheler, Heidegger, Sartre, Levinas, Merleau-Ponty and Gadamer.